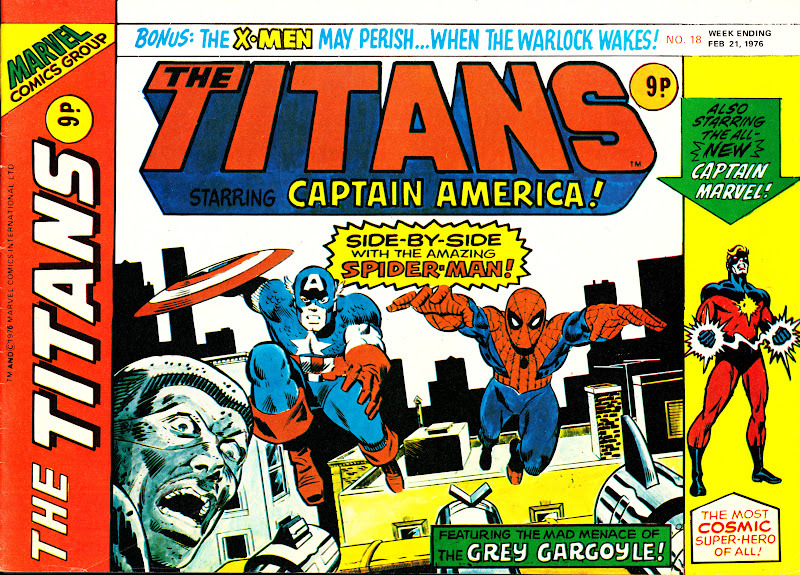 In October 1975, British Marvel flipped! 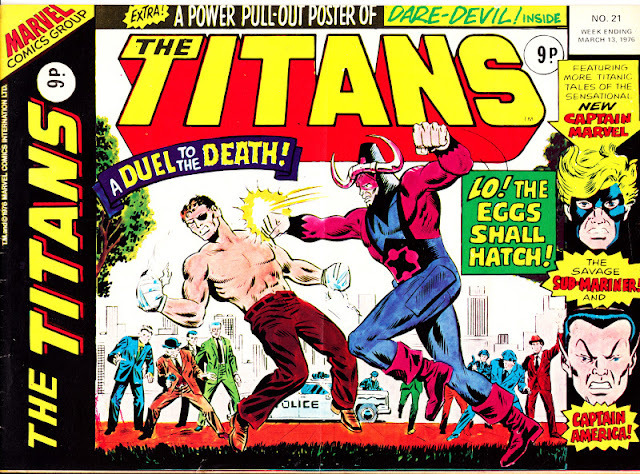 On a mission to give British kids more punch for their pence, Marvel experimented with the eccentric landscape format. 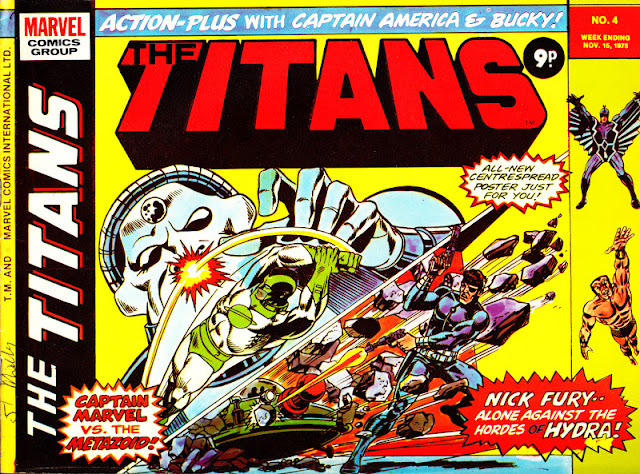 The so-called TITANS format involved turning the A4 comic on its side so that the staples now ran along what would have been the top. 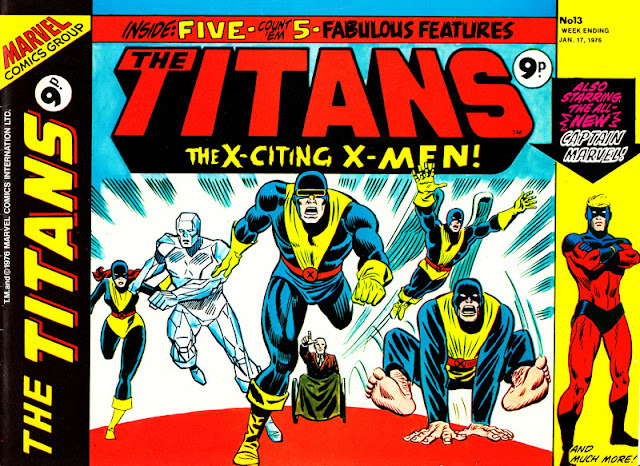 The paper format was still the established mix of glossy colour covers and black and white interiors on cheap paper. 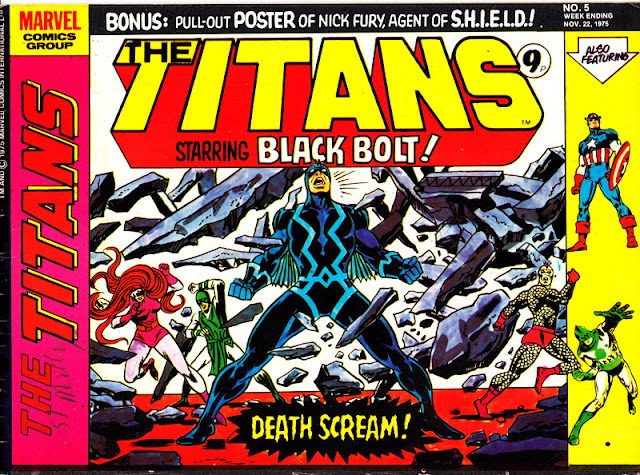 The new format required the production of new landscape "widescreen" cover artwork. Inside, some new landscape splash pages and posters were producers (by uncredited US artists) while the existing US pages were shrunk to A5 size and printed side-by-side, two to a page. The reduced size, and Marvel's patchy printing, did the artwork no favours. The two-to-a-page formula allowed Marvel to (give or take) run twice as many story pages as one of their traditional portrait-style weeklies. 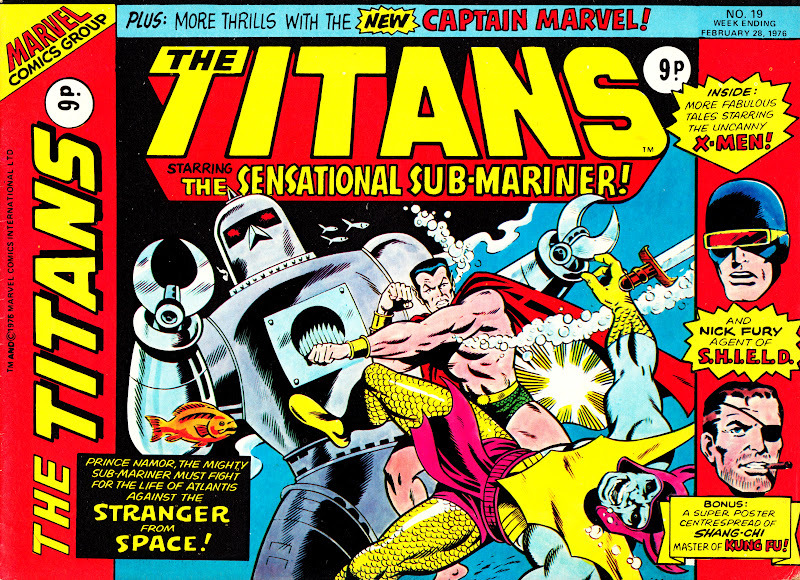 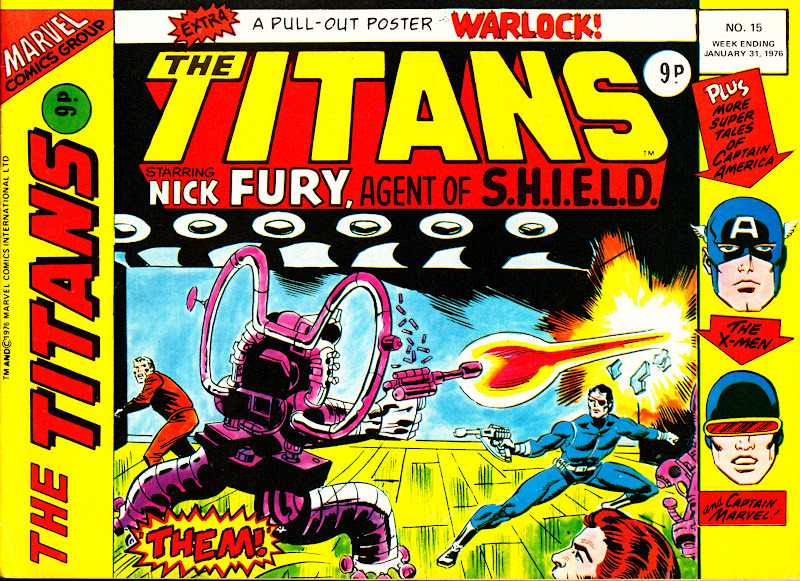 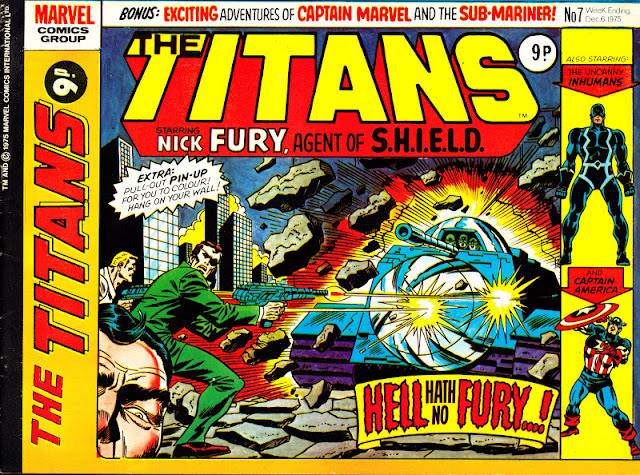 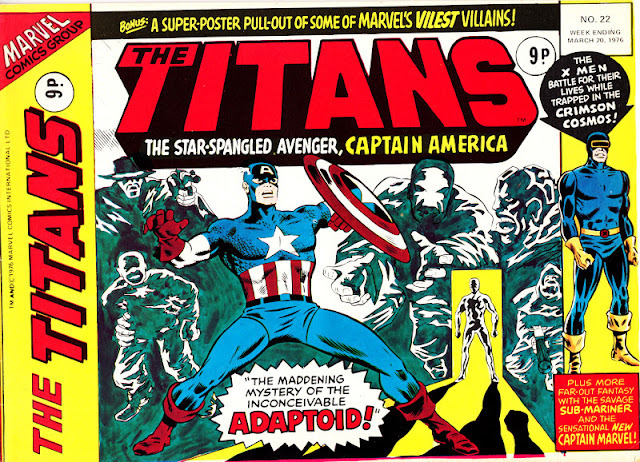 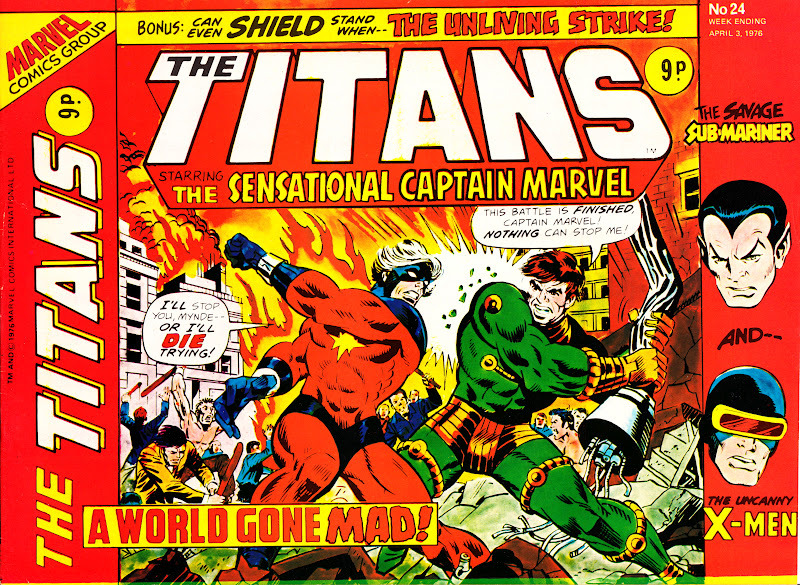 The Titans' line-up consisted of (all reprints) Captain America, The Sub Mariner, The Inhumans, Captain Marvel, Nick Fury, The X-Men, Fantastic Four and Ghost Rider. 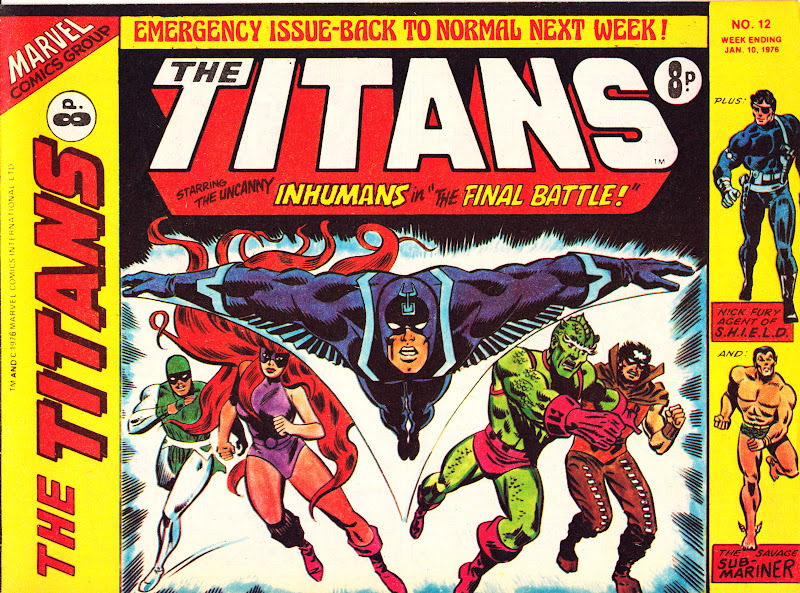 The new weekly was accompanied by a major promotional push. 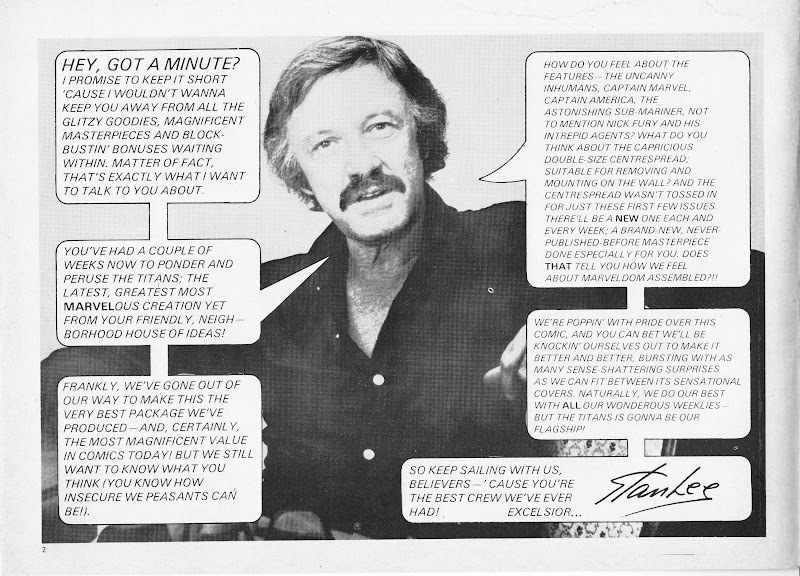 Coinciding with the first issue, Stan Lee travelled to the UK for a series of media interviews and personal appearances including a display of Marvel art at London's ICA and a talk hosted by Lee at Camden's Roundhouse (a sell-out thanks to heavy promotion in the weeklies). 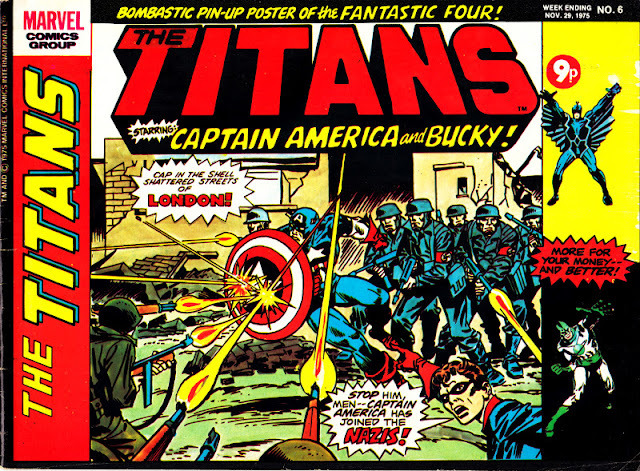 We'll do more about Lee's UK visit in a future post. 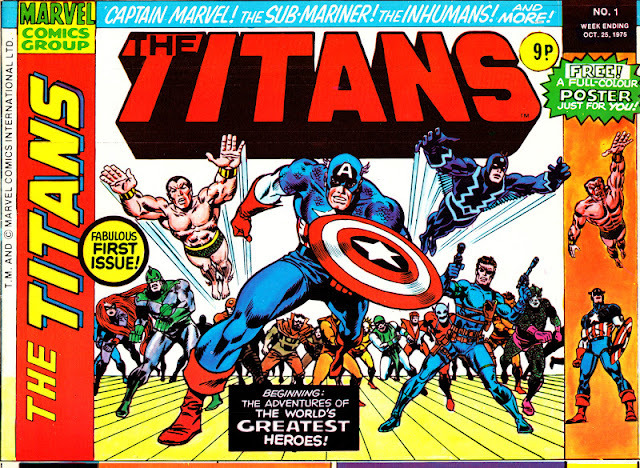 Inexplicably, issues 11 and 12 were special "emergency" issues with a reduced page count and no glossy cover (and a penny off the cover price to compensate). 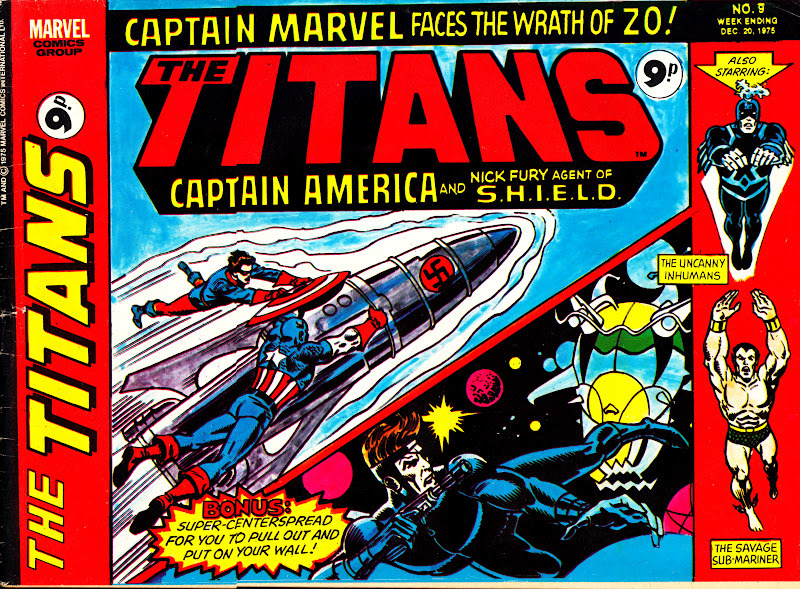 Marvel clearly knew this was on-the-cards as they had time to change the pagination of the issues and include a line of cover text. 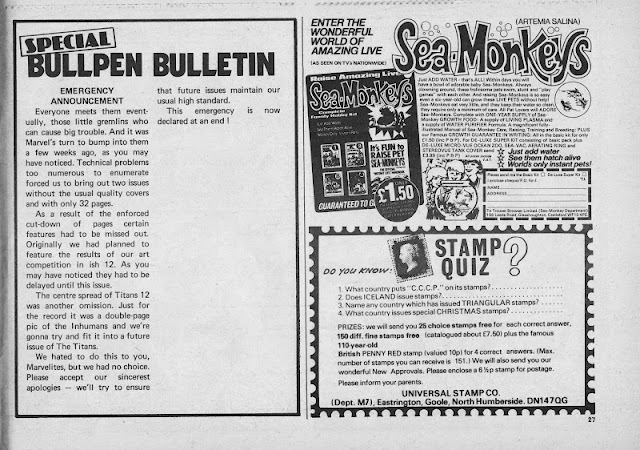 An explanation (of a kind) appeared in issue 14, placing the blame on mysterious "technical problems". Presumably this was either a lack of paper or mechanical problems at the printer. Marvel used to print two weeks worth of issues in one hit, explaining why the problem affected two issues. The Titans format was obviously deemed successful enough to also be adopted by SPIDER-MAN, partially to allow it to accommodate refugees from the just-cancelled THE SUPER-HEROES. Spidey flipped from issue 158. 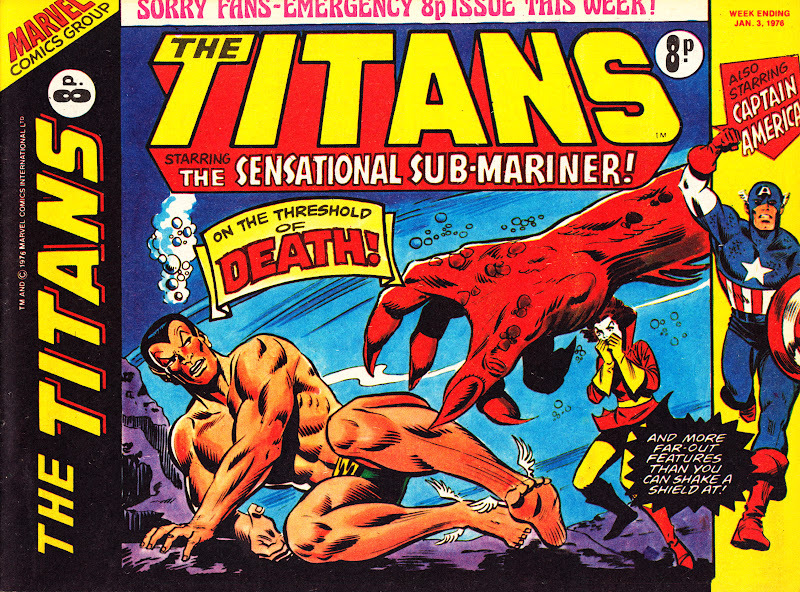 What no-one at Marvel seemed to have seriously considered is that the Titans format devoured material twice as fast as the existing weekly package, exhausting strips even quicker. 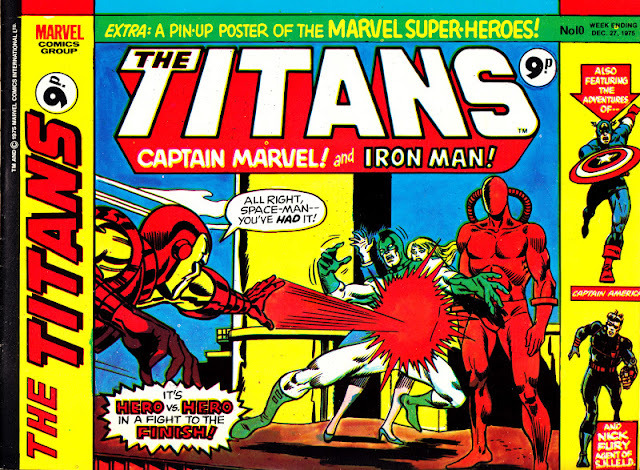 That's fine for strips with years of back-issues available to plunder but dangerous for the likes of Spider-Man which was already rapidly catching-up with the US editions. 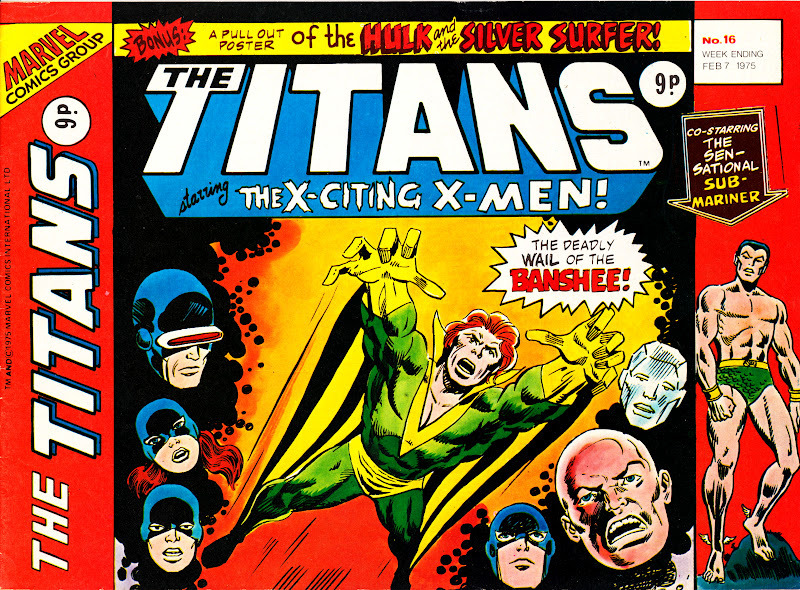 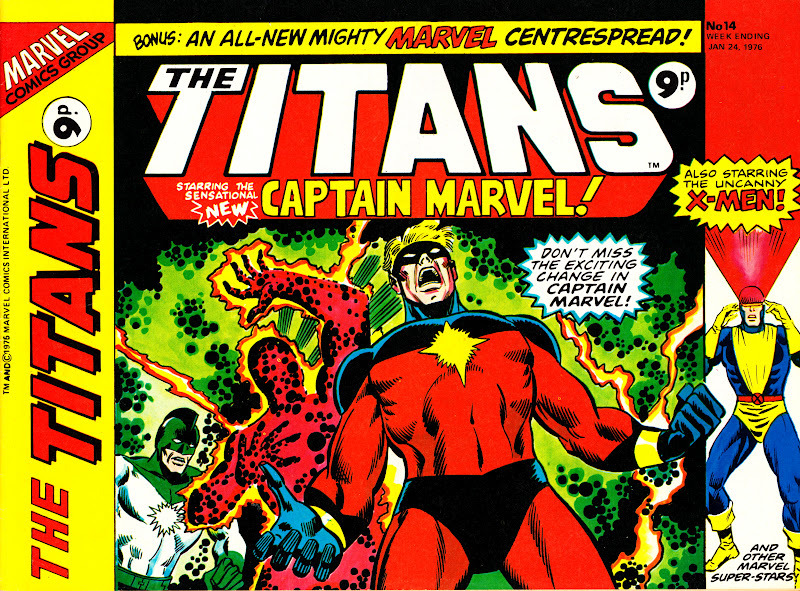 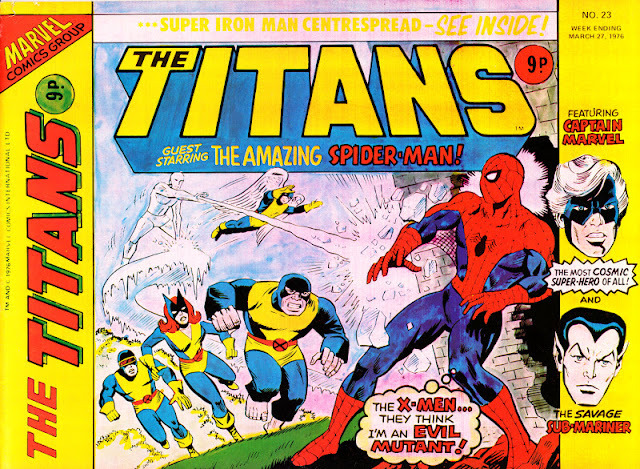 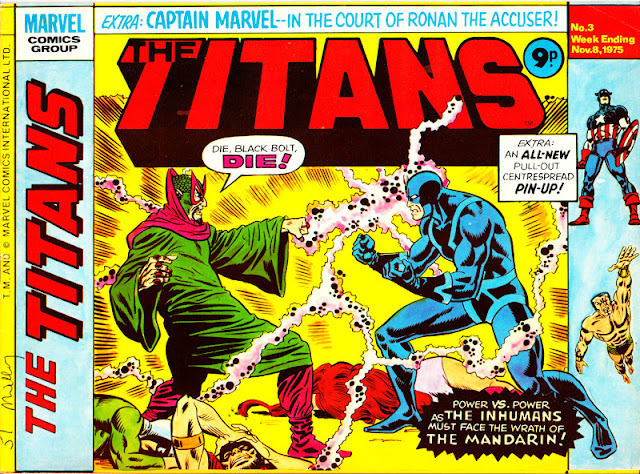 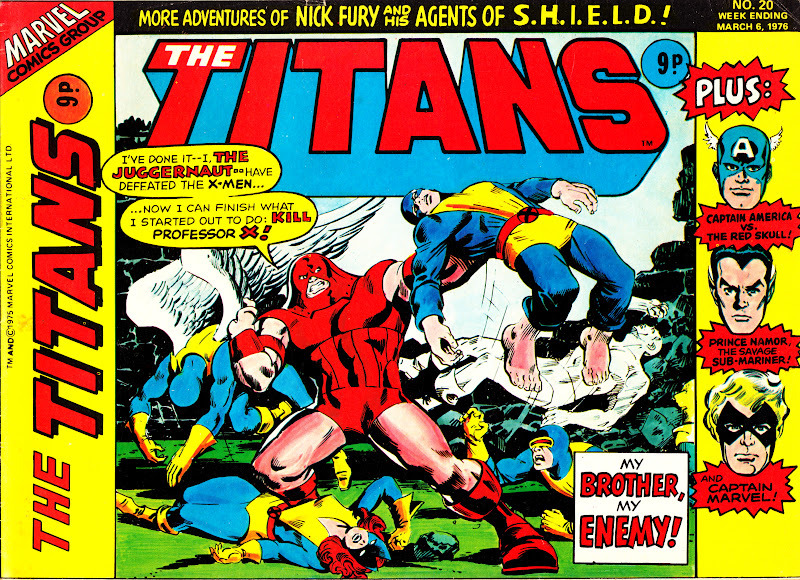 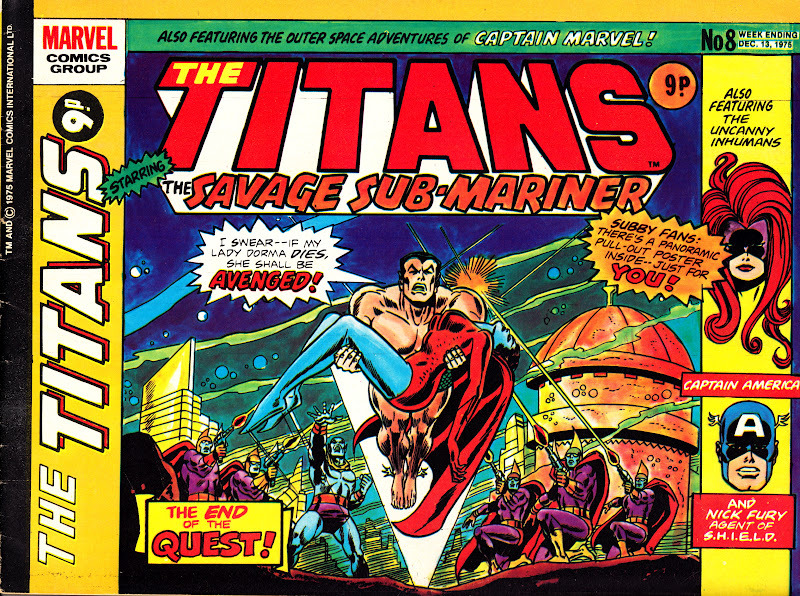 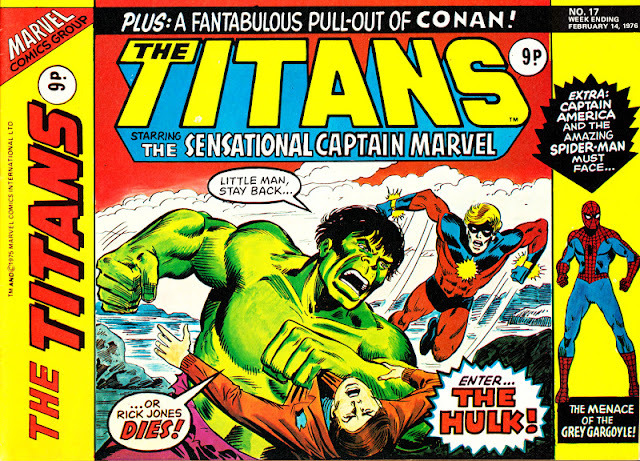 The Titans folded after a year, merging into SPIDER-MAN from issue 199 (1 December 1976) and retained cover-billing until issue 230. 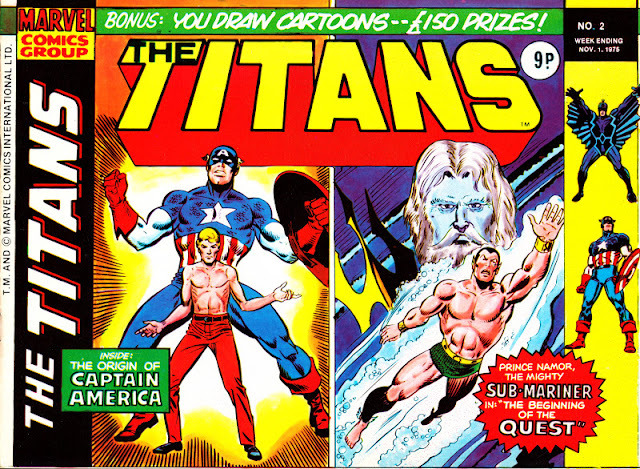 The Titans brand was revived, briefly, in 1980-81 for THE TITANS POCKET BOOK. Explanation (of a short) for the emergency issues.